How can I exit recovery mode with my iPad? I accidentally got my iPad into the recovery mode, and now I'm stuck here. Does anybody know how can I exit iPad recovery mode without restoring it. If you've ever experienced it and got out of it finally, please share your solution to me. Thanks in advance. The way that this article is going to share is very simple. 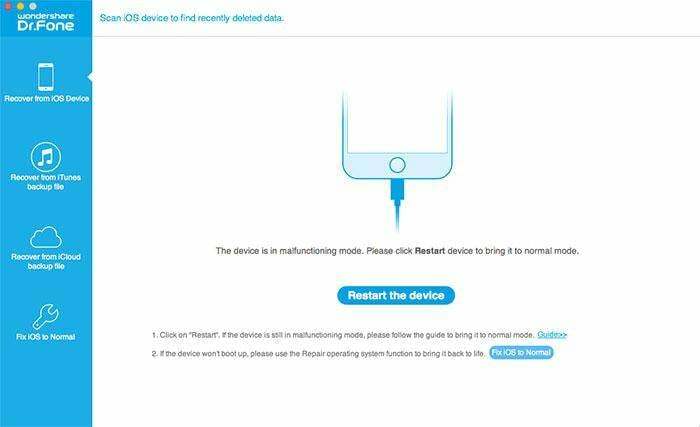 With a third-party tool, you can exit iPad recovery mode with one click. What's it? 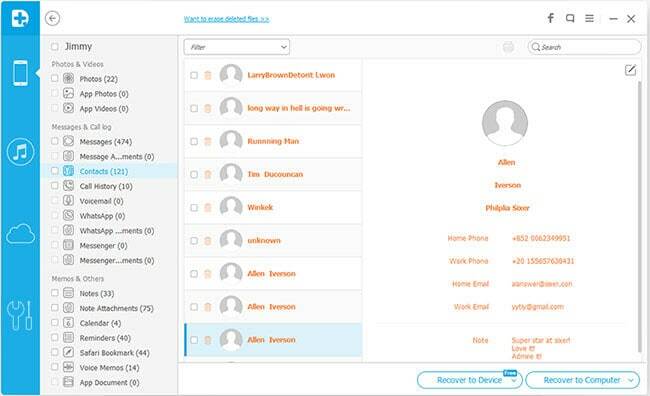 Look here: Wondershare Dr.Fone (Mac) or Wondershare Dr.Fone for iOS (Windows). Both versions of the software allow you to exit iPad recovery mode with one click, and they support all iPads. So don't worry about it now. 1. Connect your iPad to the computer, and then launch the program. 2. 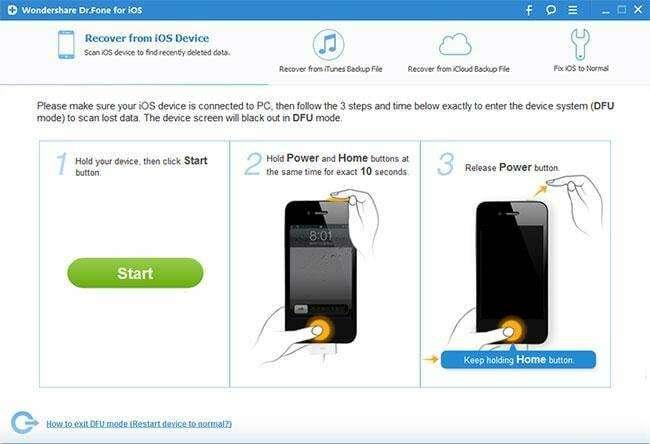 When your iPad is deteced by the program, Windows users can click Restart to exit iPad recovery mode. Mac users can click Set Up to exit iPad recovery mode. 3. When you clicked the buttons, your iPad will be restarted and back to normal in a few seconds. OK. Now you've successfully exited iPad recovery mode. Well, the software offers more than this function. 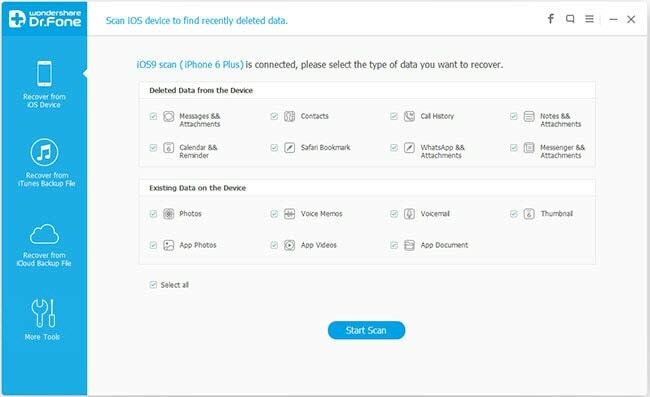 It allows you to recover lost data or backup existing data on your iPad to the computer. Next, let's check the steps one by one together. It's a little different for different iPad users. If you use iPad with Retina display, iPad mini, The new iPad or iPad 2, the program's window will be as follows. Here you only need to click Start Scan to find data on your iPad. 1. Hold your iPad and click "Start". 3. Release the Power button, and keep the Home button pressed for another 15 seconds, until you're told that you've entered the scanning mode. When the scan ends, the program will generate a scan result for you, where all found data are classified into categories like camera roll, contacts, SMS, notes, etc. You can preview them one by one. Choose the one you want and click Recover to save it on your computer. Note: Data you find there includes deleted data and existing data on your iPad. To separate them, you can use the sliding button on the top: Only display the deleted items.